We have really enjoyed 007’s seduction devices throughout the franchise’s history, perhaps none more so than the Fortnum & Mason picnic basket of Never Say Never Again (LINK), but the wordplay between Naomie Harris character (SPOILER – we don’t know she will become Moneypenny yet, although learned viewers have their suspicions), and Commander Bond, is a treat. However, the seduction attempt fails. A landmark moment in James Bond history, surely. With towel wrapped at the waist and battle scars visible (we’re sure they move throughout the movie), Bond is shaving in a bathroom that does not have a door. The scene cuts away while James washes off his shaving cream, lighting some candles on the hotel balcony and moving one of those heavy hotel room chairs outside, before presumably re-applying shaving cream so that Moneypenny can kneel between his be-towelled legs to have a go at shaving. Skyfall features 007 making a big show of shaving for the first time. It is an old fashioned process that features a shaving bowl and brush and a cut throat razor. There is an adage that when directors and writers are involved with the James Bond franchise for the first time, they are told to read all of Ian Fleming's novels when they get stuck. Moonraker: "Floris provides the soaps and lotions in the lavatories and bedrooms." Diamonds Are Forever: "He would have to send a cable to May to get things fixed. Let’s see - flowers, bath essence from Floris, air the sheets..."
Dr No: "There was everything in the bathroom - Floris Lime bath essence for men and Guerlain bathcubes for women." To quote Floris of Jermyn Street directly, "Introduced in 1951, No. 89 takes its name from the number of the Floris shop in Jermyn Street. Devoted followers include Ian Fleming." 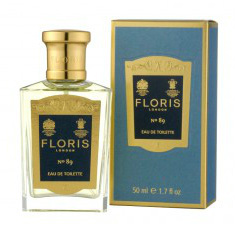 Floris describes its classic No. 89 Aftershave, which is the suspected scent of choice for James Bond, "Orange and bergamot blended with lavender and neroli give No.89 its classical cologne aspect. Warmed with a touch of spicy nutmeg, the floral heart is underscored by the dominant woody accord of sandalwood, cedarwood and vetiver in this quintessentially English gentleman’s fragrance." The description for the Shaving Bowl and soap, "Presented in a wooden shaving bowl sourced from renewable sources, this lightly fragranced triple-milled shaving soap is formulated with a blend of oils creating a rich, creamy lather to encourage the blade to glide across the skin, minimising the chance of nicks and cuts." If you are new to the world of traditional shaving, and would like to have a go, the link below will guide you to a good starter kit, which will show you how and what to do for under £50. Luxury Cut Throat Razor Starter Kit - Great gift for dads, boyfriends, husbands, best man, ushers - all men!